The engine of our 1950s De Havilland seaplane roars like a lion as we cross the last stretch of cerulean water. 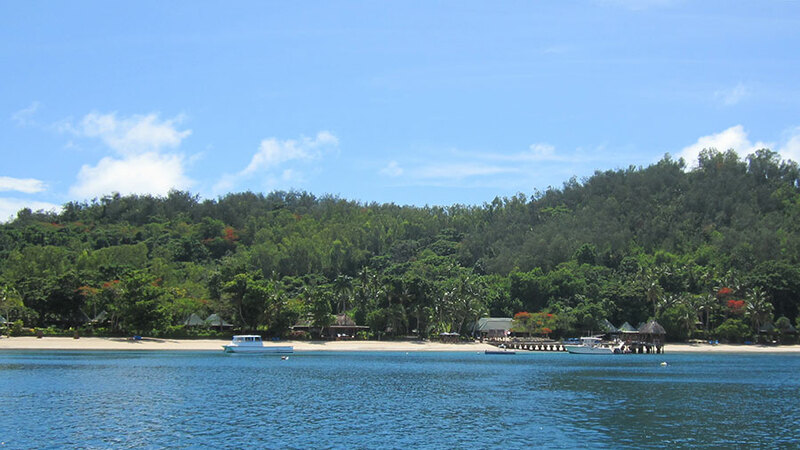 Just a hundred metres more and we’ll reach Turtle Island – our exclusive Fijian hideaway. Emerging from the haze like a desert mirage, I can see it at last. We’re home. Landing on the pale blue lagoon at the front of the resort, the seaplane comes to a graceful halt just a few metres from the shore. From here, we walk. As we awkwardly stumble out of the cabin, two Fijian men wade out to meet us (and offer to carry us to the shore, which we decline). On dry land, the welcome party sing a traditional Fijian song and offer us both a much-needed drink. 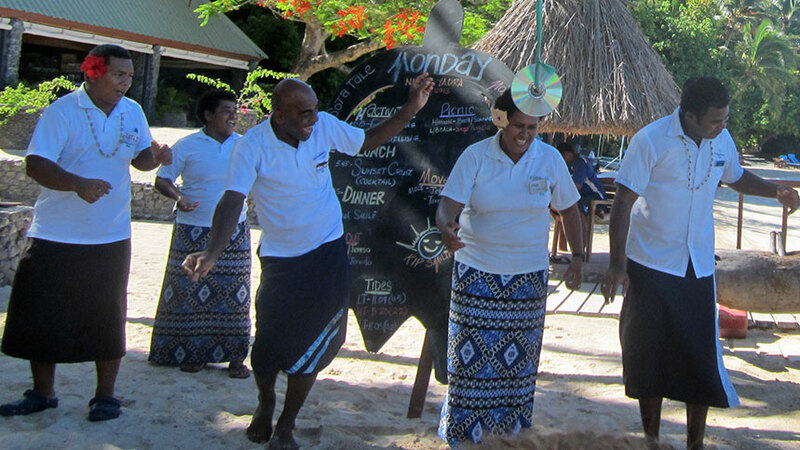 Tommy, our ‘bure papa’, is on hand to greet us at the beach and invites us to explore our private bure – number 7. 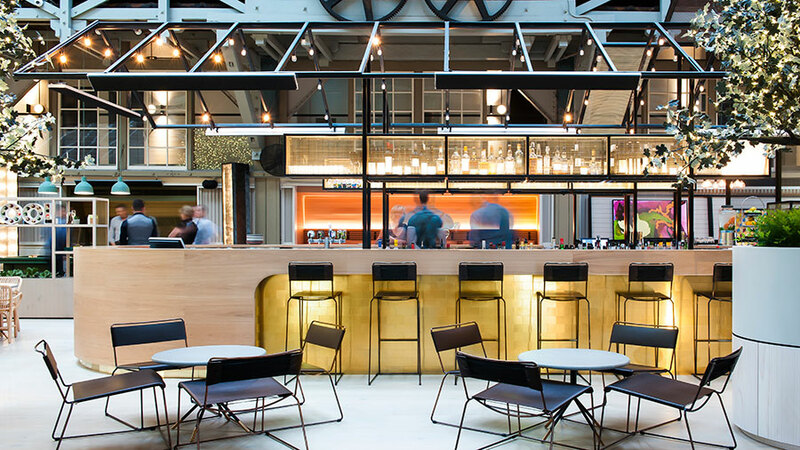 Positioned 50m from the bar and dining area, and surrounded by lush green foliage, we couldn’t wish for a better location. The view from the front door is worth the journey alone. 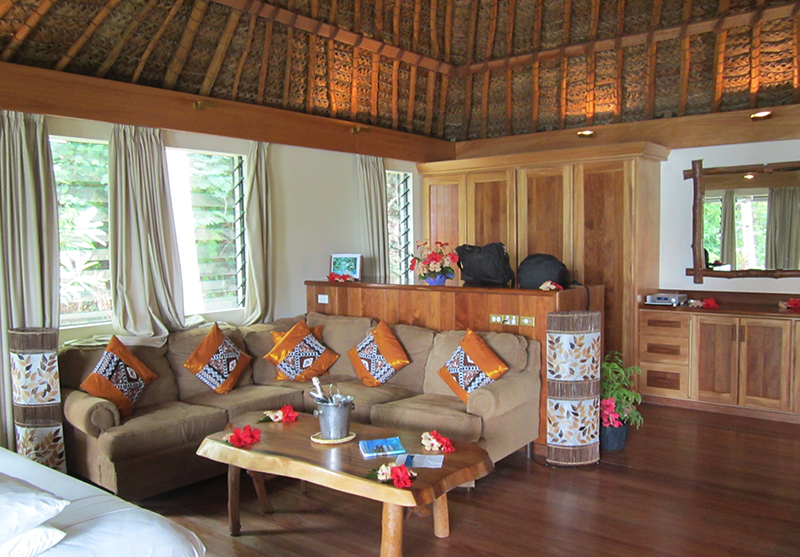 The bure itself is simple, yet elegantly furnished. 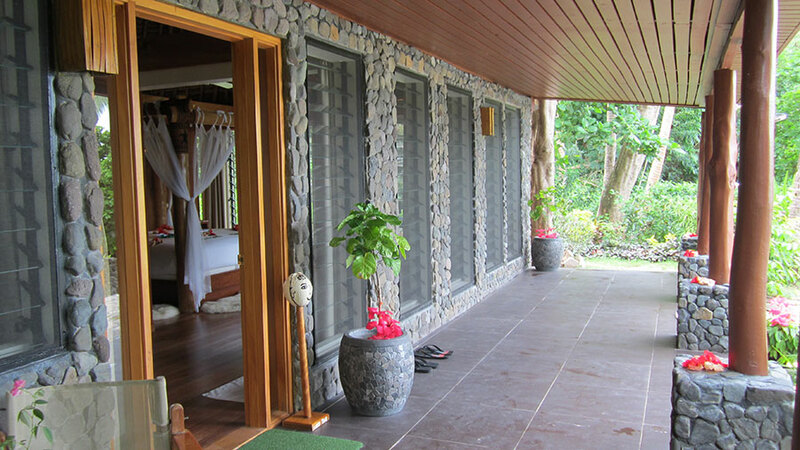 There are louvered windows on all sides, with a high thatched roof and ceiling fans to save us from the humidity. The large four-poster bed is draped in sheer white curtains, with the words ‘welcome home’ spelled out in palm fronds at the foot of the bed. Rich timber panelling covers much of the room, giving it a rustic, traditional character. I could get used to this. Darting from one side of the room to another, as I tend do at a new resort, I’m actually a little speechless. The bure is gorgeous. Behind a half height dividing-wall from the bed is an in-ground spa bath, tiled double indoor shower, and stone-clad double outdoor shower for bathing beneath the moonlight. 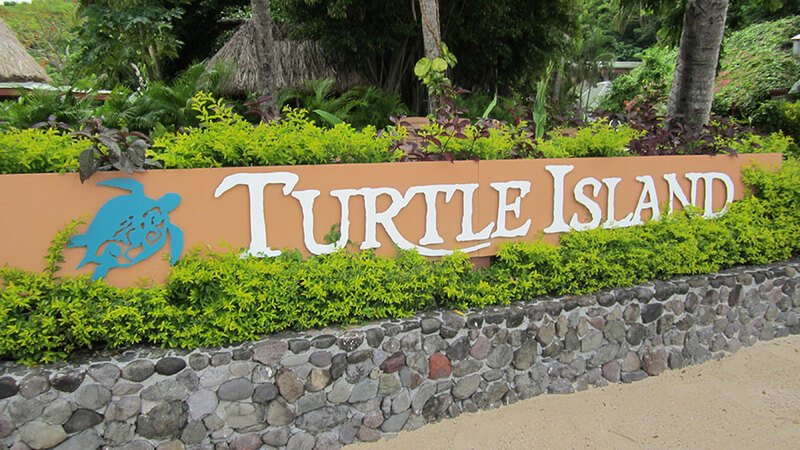 Described as all-inclusive resort, Turtle Island is just that. Food, drinks (including Moet & Chandon) and activities are part of the package, with massages and scuba dives (in addition to the one included each day) within the few additional extras. Our mini bar is stocked with a selection of beers and wines, plus freshly cut fruit and Fiji water. As our bure papa, Tommy is like our personal butler. He is here to ensure all our needs are catered for during the stay, from housekeeping to arranging private picnics and offering local knowledge. As a long time employee at Turtle Island, 15 years and counting, there’s no one better to guide us into the world of Turtle. I must admit now that this isn’t quite the resort I was expecting. Yes, it looks exactly like the pictures, but the feeling of the island is more akin to staying with friends or family than that of other resorts I’ve visited in the past. ‘Family’ is a word that is used a lot at the resort. As a guest, you’re welcomed into the Turtle Island Family. After getting acquainted with the bure, we decide to take a stroll through the resort and explore our new home. Everywhere we go, a member of the Turtle Family greets us with a cheerful ‘bula’ (Fijian for hello/welcome). All of the staff are so friendly and obliging, it’s understandable that many are long time employees. Though our island adventure has only just begun, I can already tell Turtle Island is going to be different from your run-of-the-mill resort experience. Billed as a couples’ only retreat (save for 2 weeks a year when families are permitted), the island welcomes just 14 couples at any one time. Why only 14? Because there are only 14 private beaches on the island. If only all resorts had a similar policy. One of the great advantages of having a such a limited number of guests on the island, and being surrounded by water with nowhere else to go, is that you get to meet and form friendships with the other couples. 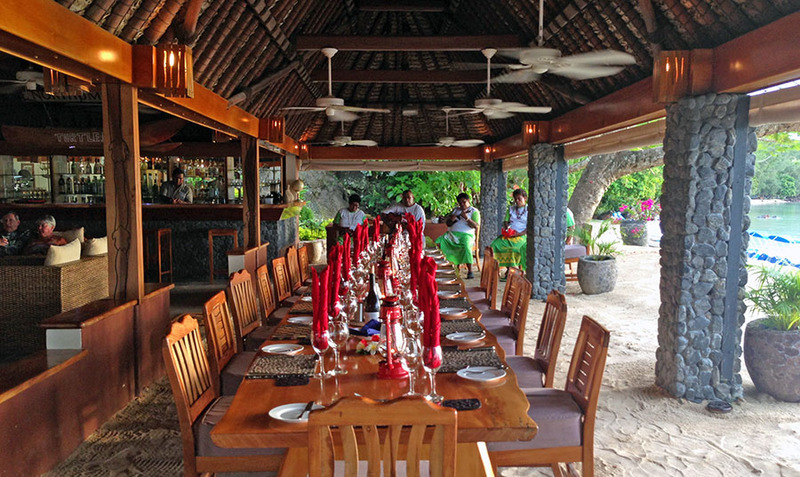 Breakfast, lunch and dinner are served in the main dining area, with all guests seated at one long table on the sand. Having the table on sand may seem like something trivial, but you’d be surprised how something so simple can break down social barriers and put everyone at ease. Each night you can chat with new people (or the same ones if you want). You can also choose to have a romantic private meal at the end of the jetty, or enjoy the gentle roll of the lagoon on a floating pontoon. We arranged our jetty dining experience with Papa Tommy as soon as we arrived so as not to miss out. There is a turtle-shaped notice board placed near the dock listing who is coming and who is leaving the island, who has which private beach ear-marked for the day, what time meals will be served, and what group activities are planned for the evening. Turtle Island is a luxurious holiday destination, but it’s not ‘luxury’. 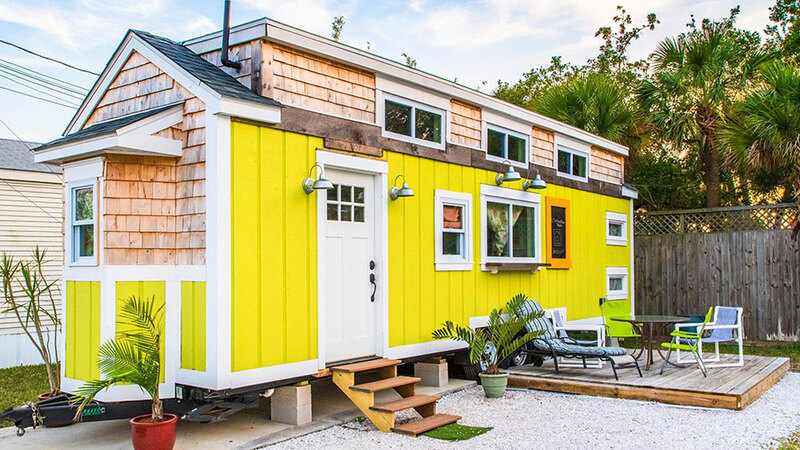 What I mean by that is that although it has the bells and whistles of a five star resort, this one does have more of a sense of reality – it’s not a cookie cutter hotel that can be easily replicated. There are small flaws here and there, imperfections that give the resort character. 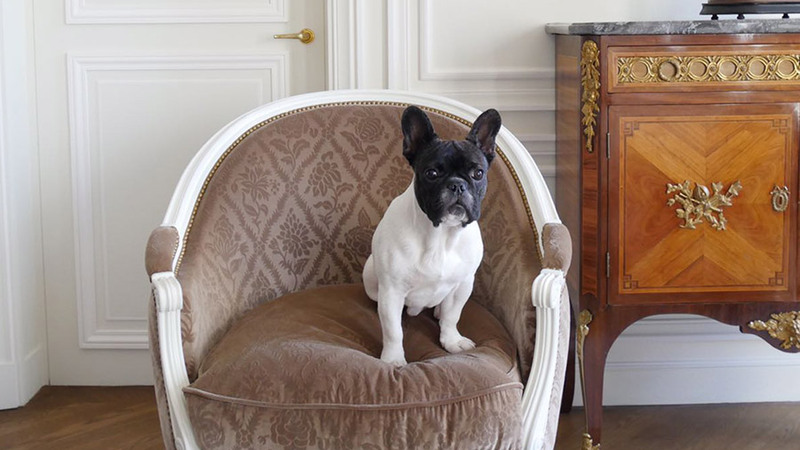 The feeling of family, of community is most evident when it comes time for guests to leave. As we dined on the beachfront one evening, just before the staff choir sang for us, the manager gave a speech that two of our fellow guests would be leaving in the morning. More than a few tears were shed as our new friends reflected on their stay. Turtle and its people quickly find a place in your heart, and the thought of leaving to re-join the world is tough. I think if it were possible, people would stay here forever. Perfection is nice, but it’s the flaws that make Turtle Island such a magical place. Diving – At Turtle Island, one complimentary dive is included per day (additional dives are extra). Operated by a dive company from a nearby island, we were picked up at around 11am each day (Fiji Time) and taken to Nacula Island – just a quick 10-minute boat ride away. Diving here in the Yasawas is spectacular. Each day we visited a different dive location, from dark and eerie caves to colourful walls that fall away to the depths. I’ve well and truly come home with the diving bug. Snorkelling – Given the location, it’s pretty much a given that snorkelling is a big part of life at Turtle. Gear is provided in the bures, meaning you don’t have to cart your mask and fins half way across the world. You can snorkel right off the beach, exploring the lagoon or sticky-beaking around the jetty. A fishing boat moored in the lagoon hasn’t moved in years, and as a result has an incredible number of soft corals covering the underside. 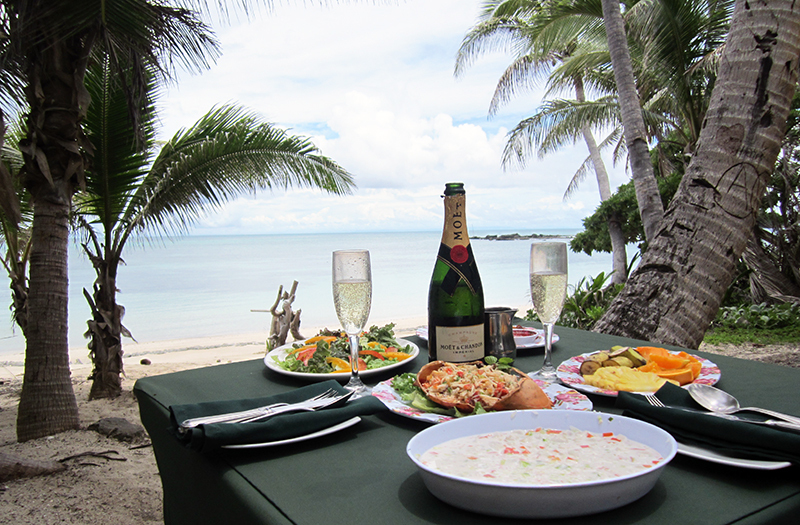 Private Picnics – Putting the island’s beaches to good use, we booked a couple of private picnics. Shell Beach and Devil’s beach are both divine, but very different experiences. Shell is a rocky area where trees overhang the water, while Devil’s is a vast stretch of sand that’s blinding in its beauty. For our picnics we feasted on grilled lobster, kokonda (a ceviche made using coconut milk), and fresh mud crab salad, followed by a bottle or two of Moet & Chandon. Heaven on a plate (and in my glass). Located in the Yasawa Island group, northwest of Fiji’s main island of Viti Levu, Turtle Island is accessed via a quick 30-minute seaplane flight from Nadi. – We stayed as guests of Turtle Island.